I discovered that my car’s front right parking light was out because the car actually displayed a message to check the light bulb. I was actually impressed that the car knows the light is out. I suppose that’s one of the benefits of having a Mercedes. I checked online and saw that replacing the parking light bulb isn’t too difficult, so I decided to tackle the job myself. I certainly didn’t want to go to the dealer anymore given how much money they charged last time for maintenance, and it’s good to learn to do these things myself. 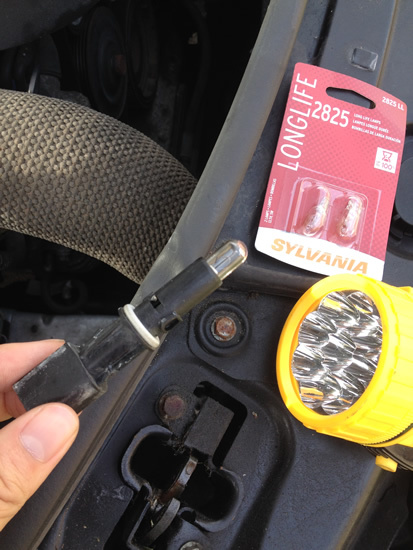 To replace the parking light bulb for the ML-350, I only needed new bulbs and a pair of needle-nose pliers. The 2006 ML-350 uses W 5 W bulbs for its parking lights. I picked up a pair of these bulbs for five bucks at the nearest auto parts store. 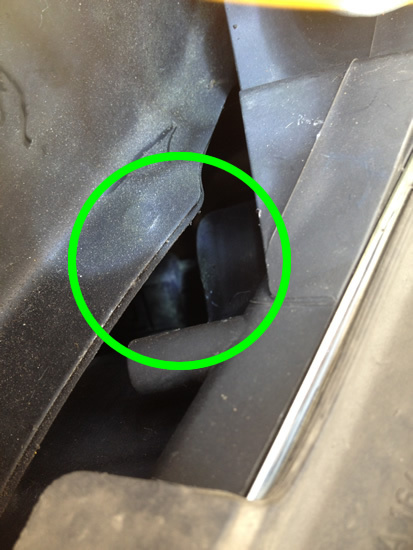 The green circle shows the hole where the parking light is supposed to go. You can only see it from a small opening from the top. 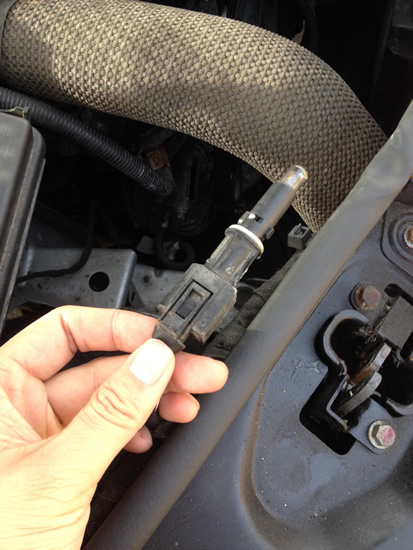 To remove the old bulb, I have to reach down and below the front part of engine compartment where the hood latch is. There is a bunch of wires running to the lights through a small opening, and the parking light is the one located closer to the center of the car. There is a small opening on the top where the parking light socket can be seen. For the right front lights, I had to use my left hand for the job. There is not a lot of space down there, and it helps to have small hands and wrists. The good thing is that my hands and wrists are not that big, so I can touch the base socket that the wires are connected to, although I can’t get enough leverage to turn the socket. In order to pull the socket and parking light assembly out, the socket has to be turned counter clockwise by a quarter turn. This is where the needle nose pliers come in. After a bit of fidgeting and trying to get the pliers into the right position, I was able to turn the socket and pull it out. There is a latch on the socket that can be depressed to detach the base socket from the assembly that holds the bulb. I depressed the latch accidentally when I tried to pull the bulb out so I ended only pulling on the base socket. 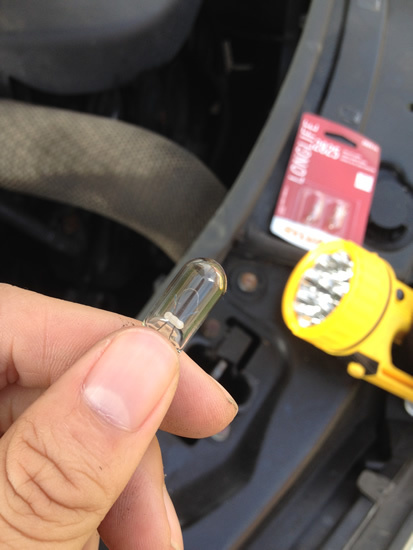 I then used the pliers to pull the assembly along with the bulb out from the hole that holds the parking light. 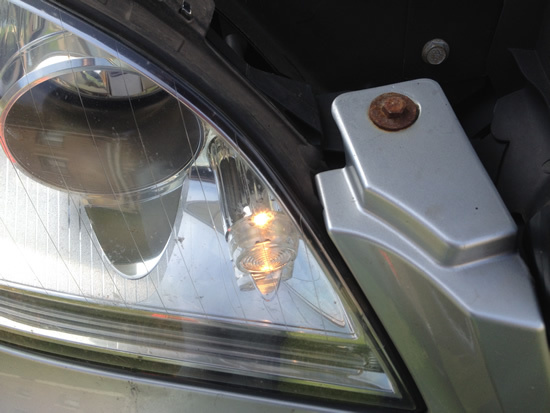 The parking light assembly and bulb removed from the headlight compartment. The parking light assembly, connected to the base socket. You can see the release clip near my thumb. Replacing the bulb is easy once the assembly has been pulled out. The old bulb can be pulled from the socket and the new bulb pushed back in. Before putting the new bulb back to where it’s supposed to go, I tested the new bulb by turning on the parking lights, and the new bulb lit up as expected. Testing the new light bulb before re-installing the light. Putting the assembly back was basically the removal in reverse. 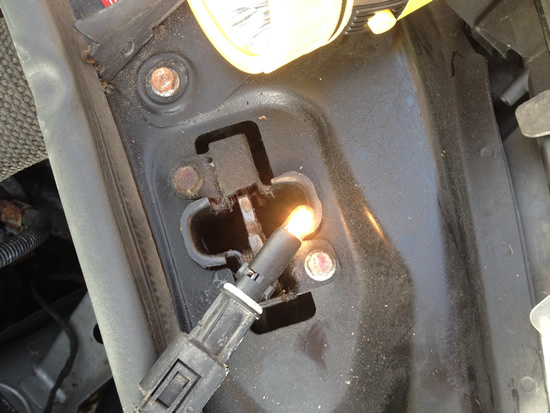 I connected the parking light assembly back to the base wire socket and put the whole thing back in with the pliers. It was hard to push with the pliers so I used my finger to nudge the light back into the hole that it’s supposed to go. The correct way to put the light back in is to the have the release latch on the base socket to be a quarter turn counterclockwise from the top. Once the light and wire were back in, I used the pliers to turn the socket clockwise until the latch faced up, and with that the re-installation was complete. Of course, I tested the light one more time by turning the light switch on inside the car. The parking light has been re-installed and is in full working order. Overall, replacing the parking light bulb was a pretty easy job. I think it took about 10-15 minutes to replace one bulb. The only tricky thing is that there is not a lot of room to maneuver near the headlights. I was able to reach the parking light with needle-nose pliers, but those with larger hands may have to buy a pair of long forceps to be able to turn the socket. Supposedly you are supposed to replace the parking lights in pairs, but the other one seemed fine so I didn’t bother. I think I’m going to start doing most of the routine maintenance on the ML-350 by myself from now on. Taking it to the dealer is getting too expensive for my tastes, even when there is nothing wrong with the car. I think the next job I’ll tackle is changing the spark plugs. I saw a video online and it doesn’t seem to be too hard, but I do have to buy the spark plug socket and an extension for the wrench.